Apple's iOS 9 is the latest release of their operating system, and along with several other improvements, this particular version attempts at making a businessman's life simpler. Apple has always surprised its customers with cutting edge technology and has challenged its competitors every single time, and its new business focused app support aims to change how business people work using their phones on a day-to-day basis. Today, Apple's App Store boasts of having over 1.5 million iPhone apps, leaving customers spoilt for choice. The iPhone is to business users what Blackberry used to be, an indispensable part of any business. At the same time, with numerous iOS capabilities and technologies incorporated into iPhone business apps, it can get difficult to choose the right app for your business. Let's have a look at the apps which can help your business perform better. With iOS 9, The next generation of business apps take advantage of iOS' unique and powerful capabilities such as Touch ID, iBeacon, Handoff, App extensions, AirPlay, etc. These unique business apps are now helping in streamlining workflows and making everyday tasks much more productive. Make use of the powerful features and possibilities which can take your business to new heights. Here we have categorized the different iPhone capabilities and listed the iPhone apps which make use of them. This technology lets your iOS device automatically detect proximity to a particular location. This feature can be used to check the availability of meeting rooms, checking if employees are present in the office, or to improve customer service by providing personalized messages to your clients. This iPhone app manages employee access without the use of any physical badges or credentials. This app uses the iBeacon technology to detect the whereabouts of the shopper on the store floor. This can be used to provide personalized service and recommendations. This iOS capability allows you to start a task on one iOS device and then later continue on another device. So if you are traveling and want to catch up on the work which you started earlier on your Mac, by logging in to the same iCloud account, you can continue with the task on your iPhone. This app simplifies managing daily tasks and with Handoff, you can list things on your iPhone and later mark them as completed on your Apple Watch. This app makes it easy to join meetings on your iPhone while commuting and then later hand off to your Mac once you reach office. Inherently a fingerprint sensor, Touch ID does more than just unlocking your iPhone. It helps to access your apps securely and manage your critical data without the hassle of multiple passwords. A single fingerprint touch ensures that all your data is safe. This app creates a secure vault for all your passwords of different accounts and apps. Access to all your data, websites, and business apps can be done with a single touch. This app is aimed at businesses, and enables users to digitally sign documents using Touch ID. This avoids the hassles of printing the documents and then signing them. Location services are an extension of GPS technology, and allow you to get the right information at the right time. This technology can have certain implications on how you conduct business, and can increase your productivity by helping you navigate to reach your client's office or automatically capturing and updating location information of a construction site. This app simplifies and speeds up any safety inspection. With Location Services, this app logs location data for more accurate and efficient inspections. This app uses Location Services and smart-drive technology to detect your route, track mileage, and calculate your business travel reimbursements very easily. Now you can use the built-in camera on your iPhone in more innovative ways than ever before. Leverage your phone camera in business apps to simplify daily tasks, view augmented visualizations, and even replace complex manual calculations with just a tap. This app allows you to measure rooms and door floor plans by just clicking a picture. Attributes and annotations can be added to a snapshot to create an indoor map. This app uses the camera to easily view the sun's location and the solar path. This further helps in designing architectural plans or selecting an ideal time for a photo shoot. Airplay allows seamless sharing of your work with other iOS/Mac users. It can be used to easily share photos, documents, etc. from iPhone to Apple TV, Mac, etc. wirelessly by simply tapping into AirPlay without having to connect to your organization's network. Making attractive presentations is an easy task with Keynote. AirPlay makes it very simple to share it with a group of people or stream it wirelessly from any iOS device. This app helps you draw a new product design, outline a business plan, or create diagrams. With AirPlay you can share the same on big screens and present it to a larger crowd. Extensions allow you to do more with the apps on your iPhone. Work in one app while opening another app's functionality and content across iOS. One can also view daily tasks in the notification center and share documents between apps. This app extension allows you to view all your notes, checklists, and quickly access the common functions of the app with a single tap. This app extension allows you to automate functions across other apps. Using Workflow you can easily launch workflows from inside the app. Why Choose Outsource2india for iPhone App Development? Develop your iPhone App with Outsource2india in Order to Improve Business Performance! Our experienced team of iPhone app developers has the capability to create innovative, user-friendly, and dynamic iPhone apps that will help to improve your business productivity and earn greater revenues. 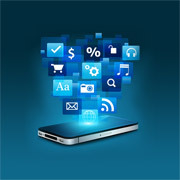 We have the expertise in developing apps on various platforms such as iOS, Android, Windows, etc. If you have any kind of iPhone app development requirement, feel free to fill in the contact form and we will get back to you within 24 hours.